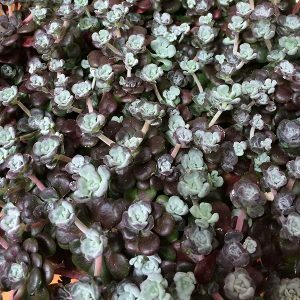 From the rocky hillsides of North Americas west coast, Sedum spathulifolium ‘Purpureum’ is a low growing succulent. Sometimes called the Colorado Stonecrop, and more commonly The Purple Spoon Leafed Stonecrop it thrives in rocky soils and sunny positions. This is an excellent ground cover plant for the rock garden and also grows well in containers. The blue and purple foliage lasts well right through the year, in spring to summer this low growing plant will flower. Yellow flowers rising on tallish stems above the foliage. With a number of garden uses, we think that the Purple Spoon Leafed Stonecrop looks great in a container by itself. It will spread to overflow the edges, the foliage has good colour and texture. You could also use it in the garden as a ground cover plant for a sunny position. The foliage forms a dense mat over time and the plant requires very little care. Best grown in a sunny position, in a well drained soil and a frost free position as well. It is not really suited to very cold winters and frost can damage the plant. Position – Full sun, frost free. Spread – Will spread to form a clump of around 30 cm (12 inches). More over time in good conditions. Foliage – Blue suffused with purple, foliage colour will change depending on the amount of sun it receives.. Flowers – Yellow on tall stems. Flowering Time – Spring to mid summer depending on climate. Pruning – Generally not required. Foot traffic – Not suited to foot traffic. Propagation – Easy by division of established clumps. Fertiliser – Little to no fertiliser is required. One or two applications of a liquid seaweed fertiliser in spring is adequate. Over fertilisation can cause leggy growth.